Queen of the Sun: What Are the Bees Telling Us? is a profound, alternative look at the global bee crisis from Taggart Siegel, director of The Real Dirt on Farmer John. Juxtaposing the catastrophic disappearance of bees with the mysterious world of the beehive, this engaging and ultimately uplifting film weaves an unusual and dramatic story of the heart-felt struggles of beekeepers, scientists and philosophers from around the world including Michael Pollan, Gunther Hauk and Vandana Shiva. Together they reveal both the problems and the solutions in renewing a culture in balance with nature. For twenty-five years Taggart Siegel has produced and directed Emmy-nominated, award-winning documentaries. Broadcasted and distributed worldwide, Siegel's films bring compelling voices and visions to a global audience. The Real Dirt on Farmer John, Siegel's critically acclaimed documentary about a maverick visionary farmer, won thirty-one international film festivals awards and was released theatrically around the world. It was broadcast worldwide and was aired in 2007 on Independent Lens. The Real Dirt on Farmer John was written up by Roger Ebert for it's US theatrical release as "A loving, moving, inspiring, quirky documentary" and by former Vice-President Al Gore as "Unbelievably special…a real and gripping story with insight and humor." Taggart Siegel is the co-founder of Collective Eye, Inc., a nonprofit media production and distribution organization based in San Francisco, California and Portland, Oregon. 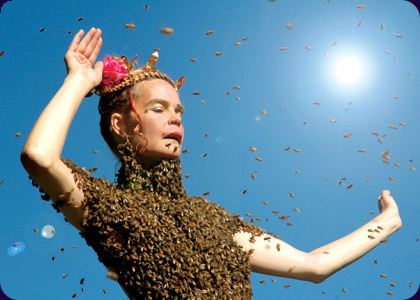 His most recent film, Queen of the Sun is a profound, alternative look at the bee crisis. Jon Betz is a Portland-based documentary filmmaker and producer for Queen of the Sun. He is a graduate from Rhode Island School of Design where he received the Tiffany Rosen Scholarship Award for Excellence in Narrative Filmmaking and Fine Arts Award for Excellence in Film. Betz's work strives to maintain a high degree of artistic craft while digging deeply into the spiritual, emotional and ethical issues surrounding his characters.